The Rev. Dr. James A. Forbes, Jr. is president of Healing of the Nations Ministries and serves as national minister for the Drum Major Institute. He is senior minister emeritus of The Riverside Church in New York City where he pastored for 18 years. He was the first Joe R. Engle Professor of Preaching at Union Theological Seminary in NYC and taught homiletics for 13 years. Additionally, Dr. Forbes is a highly acclaimed author, scholar, and nationally sought-after speaker, affectionately referred to in national and international religious circles as the “preacher’s preacher” because of his extensive preaching career and his charismatic style. Newsweek magazine once recognized Forbes as one of the 12 “most effective preachers” in the English-speaking world. As a passionate educator, administrator, community and human rights activist, and interfaith leader, Dr. Forbes was twice designated as one of America’s greatest Black preachers by Ebony magazine. Dr. Forbes is a featured TEDex speaker and also a frequent guest and contributor to top national media outlets including Huffington Post, MSNBC, and others. He has authored several books, including "Whose Gospel?" (The New Press) and "The Holy Spirit and Preaching" (Abingdon Press). 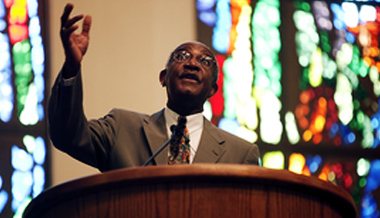 James Forbes on God's intentionality that we be one in love.